*Pillow kits are shipped to USA and Canada only. * Paint sold separately. See fabric paint tab below. Create your own stenciled custom designer accent pillows with our Paint-A-Pillow Peacock Feathers stencil kit! Stenciling isn't just for walls or furniture, it is also used on accessories, such as accent throw pillows. With our beautiful, original stencil designs, you can bring a world of color and pattern to any space in your home. Stenciling a pillow with our popular Peacock Feathers pillow kit is a fast, fun and incredibly easy way to create a personalized masterpiece that you can be proud of! An accent pillow with an unusual stenciled design can do wonders for your room, whether you're looking to just bring in a pop of color and pattern or give your space a completely fresh designer look. Most interior designers consider toss pillows to be one of the most powerful decorating accessories, capable of changing the look of the entire room. 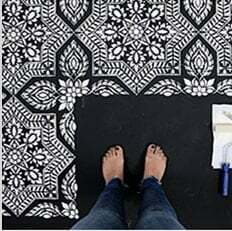 And stenciling your own pillows is an exciting, easy and creative way to give your living room or bedroom a quick, chic and vibrant makeover. These decorative stenciled accent pillows will look fabulous on any sofa or bed and you'll be proud to say you made them yourself. Our Paint-A-Pillow stencil kit contains everything you need to quickly create your perfect designer pillow: Just add paint! We also include a swatch of fabric and a small stencil if you want to practice first. Each stencil kit comes with complete illustrated instructions and is beautifully packed in a storage box with a handle, making it easy to carry and store. With a Paint-A-Pillow stencil kit, your color choices are not limited - you can pick any colors you want and even mix your own custom hues. Your creativity doesn't have to end with the stenciling! We offer exciting accessorizing options to make your pillow even more personalized and more "you". You can add studs, tassels, crystals and various embellishments to your custom pillow for extra dimension and pizzaz. Or try using textile markers to add some hand-drawn touches on the basic stencil design. Most Paint-A-Pillow stencil kits do not require the use of spray adhesive, however for more detailed designs or crisp geometric patterns you might want to consider lightly misting your stencil with spray adhesive prior to stenciling. Make sure you shake the can well and lightly mist (not drench) the stencil, and let it dry for a moment before placing it onto a stenciling frame. You can also perk up your deck and patio with these DIY designer stenciled pillows! You can use them indoors and outdoors by applying a protective mist of waterproofing spray. Create a vibrant seating area for your guests in your backyard by bringing your style outdoors. You'll find that designing and stenciling your own throw pillows is a fun and exciting craft, a perfect thing to do with friends, kids and family! It is incredibly rewarding and not time consuming at all. Consider having a fun craft pillow party with your girlfriends, or a stenciling extravaganza with your kids. Your hand-created stenciled pillows and our Paint-A Pillow kits make great gifts for friends and family.